Many businesses invest in high-quality floor systems to provide peace of mind and long-lasting beauty. 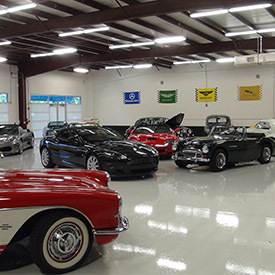 Across many industries, plain concrete flooring can be outfitted with finishes such as epoxy flooring for a durable, effective, and comprehensive solution. One factor that should play a role in any industrial flooring choice is how much continual maintenance is needed for a beautiful shine. If you’re ready to benefit from the strength and versatility of a low-maintenance system, our epoxy flooring services in Orlando are here to help! 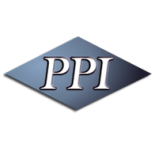 PPI Flooring has proudly served as your trusted resource for epoxy seal coating, concrete polishing, staining, and a variety of other flooring specialties. We have the experience and equipment needed to deliver a comprehensive fit for your industry-specific needs, leaving your team or cleaning crew with the task of keeping your industrial floors in perfect condition. It is important to care for your new floor system to ensure the most longevity and beauty, but luckily, epoxy flooring is easy to maintain. Today, we’ll highlight our four basic tips to help you clean your floors for long-lasting results. If you’re ready to learn more about our complete flooring solutions, be sure to contact us for assistance! Because epoxy flooring is one continuous surface, some businesses may be able to rely on a water hose and squeegee for full-facility cleaning. Concrete floors covered in epoxy provide outstanding moisture protection, making your mopping tasks easy to accomplish. In many cases, warm water is all that is needed to lift those stubborn spots. In some cases, dusting and lighting mopping will not be enough to lift stubborn areas. Employees and cleaning teams can rely on spot-checking services to erase tough stains and any discoloration. Like we just mentioned, warm water is often enough to lift any grime, but in some scenarios, a stronger chemical is needed. The nature of stain and chemical composition can change, making it essential to do your research to find the most effective cleaners. CLR, for example, can help to clean away any rust, calcium, or lime deposits left on your epoxy flooring. If you’re not sure which solution is the best for your floor’s ugly spots, be sure to contact us for assistance. Stains can come in all shapes and sizes for your business, which is why our epoxy flooring solutions can prove to be so beneficial. 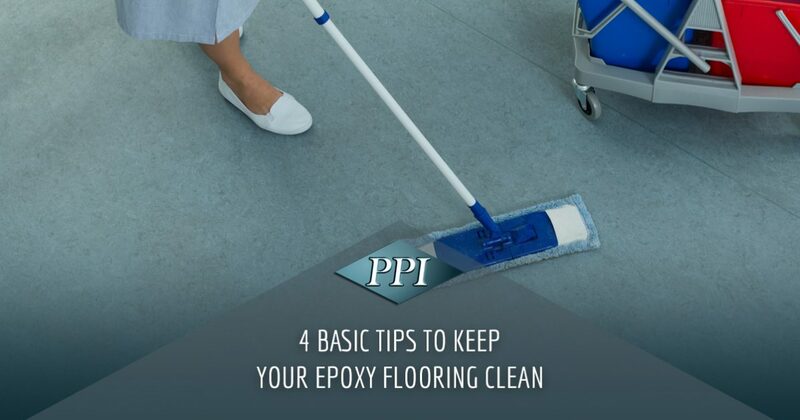 PPI Flooring can work with you to develop a cleaning plan that best cares for your unique floor system. Call us today to see how we can enhance your project! Many building managers seek out effective, affordable cleaning solutions to provide strong support for the toughest spots and stains, but keep in mind that certain chemicals may do more harm than good. Cleaners who rely on citrus can provide a clean surface, but sap the gloss’ shine. Many people look for vinegar as a natural way to buff for their floors, but soon learn that this substance also dulls glossy floors. Soap-based cleaners may provide a safer way to lift stubborn stains, but the soapy elements of this product can lead to a hazy buildup, disrupting the smooth shine of your concrete floors. The epoxy that covers most industrial flooring is meant to be tough and resistance to fading, but certain chemicals may interact and compromise the effectiveness of this system. Be sure to find an all-natural cleaner that is approved for your floors, and be sure to try a few tests in a smaller area before cutting your cleaning team loose. In many cases, dulling of the finish can result from a buildup of the cleaning agents used. One common problem that can affect the quality and longevity of your epoxy floor coating is not repairing any minor issues immediately. Epoxy flooring is meant to provide a complete surface against wear and tear, and if any damage occurs, we recommend calling your flooring contractors for assistance. In places such as manufacturing plants, damages can become the central point for moisture, chemical infiltration, and future damages. Regular maintenance can help to keep your business’ floors clean and shining for years to come, and expedient repairs can help to preserve the integrity and beauty of your building. Damages are bound to happen, so be sure to call PPI Flooring when they do! For years, our team has worked to deliver the safest and most cost-effective outcomes for all of our customers, from resurfacing clients to new projects and more. If you’re looking for quality epoxy flooring solutions in Orlando, PPI Flooring will be happy to help you achieve your project goals. Contact us today to learn more!